Visits: 44724 persons viewed this recipe. 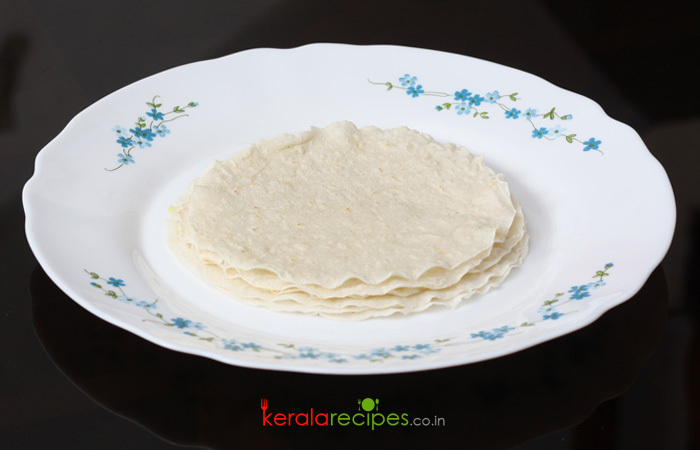 Rice Pathiri or Ari Pathiri is a kind of thin traditional roti made from rice flour. It originated from Malabar region (northern part of Kerala) especially from the Muslims of Malabar region. Nowadays it is commonly served in all parts of Kerala. Pathiri is usually served for both breakfast and dinner along with gravy type curries. There are many varieties of pathiri recipes and here you can get a very simple and traditional Ari pathiri recipe. Boil 4 cups of water in a sauce pan adding ghee and salt. When it boils, reduce the flame, add fine roasted rice flour and mix it evenly with a spoon. Remove from the flame and keep it covered for 2 to 3 minutes. When the dough is still warm, knead it well with your hand till it is soft and smooth. (if it is too hot try dipping your hand in cold water while kneading). Add more water or rice flour, depending on the absorbency of the rice flour. Make lemon sized balls from the kneaded dough. Roll the balls like chappathi/poori to get thin round shape using chappathi roller/press by spreading rice flour over it. If required, cut it into perfect round shape using some cutter or lid of a steel tiffin box. The remaining parts can be used to make another one. Heat a flat non stick pan on medium flame, place the pathiri on it and wait for a few seconds and turn it to the other side. This time you wait for little more time and turn it again. Remove from the pan when it puffs up. Make sure that the pathiris are not getting brown. (do not use oil). 2) A perfect kneading is required for good pathiris. Hi Jeni, Thanks a lot for the wonderful feedback. Nice to know that you done it well. I will be posting more quick and easy recipes in the near future. Shuld we roast the store brought powders…. Thank u in advance…. You are welcome Nisha. It is not required to roast the powder if it is already roasted and packed. Please do share your feedback if you happen to try this recipe. Thank you. Can I use Nirpara pathiri powder? I am a Tamilian married to a malayalee and am truly grateful to the recipes you post, I am able to prepare and it tastes delicious. I agree that cooking is equal opportunity. I am also a software engineer, a male and a great cook. Hi, Wonderful recipes, Visiting your site for first time. I am trying the pathiri recipe this weekend. It had been long since I tried something new in kitchen. I hail from Kanyakumari bordering Kerala, married to a gentleman in Chennai 😉 The cuisines vary lot, also I don’t want to lose the touch of those yummy recipes I am nervous and equally excited. Can I use Idiyappam flour for making this recipes? Thanks in advance. Hi Shaan, I read your reply thanks for it. But its not the one I asked for. Yes it was the deep fried one I also had that once we were going for a trip to mysore. That is somewhere thorough wayanad route…. Reshma, Thanks for the reply. I will try to add the recipe you asked for. Thank you Shaan, I’m looking forward to it. I never tried ari pathiri recipe thinking it will not come up the way it look. But surprisingly very attempt with your recipe it was thin, soft and tasty. Diji, I am really happy to know that you done the Pathiri well in your first attempt itself. Thanks a lot for the feedback and hope to see you here often.